Borrowers needing a small loan can turn to p2p lending marketplace Ratesetter, which matches borrower requests with funding supplied by private lenders. Borrowers can choose a variable rate loan (rolling loan) or a 36 months fixed rate loan. 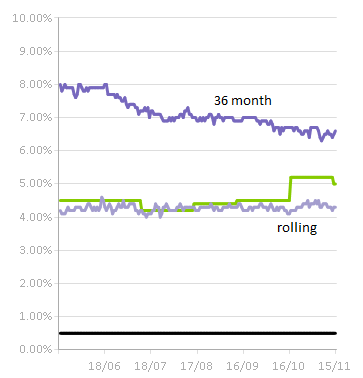 Nominal rates for the 36 months loan have fallen considerably in the past six months from approx. 9% to now under 7% (that translates to a representative APR of slightly under 9%). Ratesetter has facilitated over 10 million GBP in loans since its inception. Last week Ratesetter completed raising series C round of funding, raising 1.5 million GBP (approx. 2.35 million US$). The total amount raised so far is 3 million GBP. RateSetter CEO Rhydian Lewis said: ‘…RateSetter is continually working to narrow the spread between what Savers can earn on their money and what creditworthy Borrowers can pay. This investment will ensure that customers will continue to get great value and a great service‘.